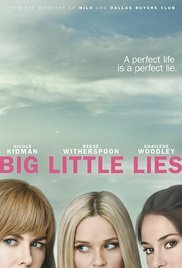 Big Little Lies (♦♦♦♦): Jane Chapman, mom to six-year-old Ziggy, is a newcomer to a posh community in Monterrey better known for the quality of its public elementary school. Instantly she becomes friends with Madeleine McKenzie, mom to Chloe and Abigail, which comes very handy when, on Orientation Day, Ziggy is singled out by classmate Amabella for attempting to choke her. Everything goes downhill for Jane and Ziggy from there. Suspicions fly, fingers point, and even mothers and fathers will have something to say about what is going on inside the first-grade classroom and the dynamics between their children. Now I understand what Sarah @ Sarah’s Book Shelves means by Moriarty’s “mommy politics”, because this series has a lot of that, but I was endeared by the excellent cast, the quality of the production, and the idyllic coastal community with its fish bowl houses that are in themselves a metaphor for the lives on display at the center of the series. I must give kudos to Reese Witherspoon for starring as a troublemaker; she was brilliant, as was Nicole Kidman as the tormented and abused lawyer-turned-full-time-mom. I thought that the two main mysteries at the center of the plot were going to be left unsolved, but, even though I guessed one pretty much from the start, the director did a very good job of creating tension and building suspense so one wouldn’t know until the end what really happened at that fundraiser. 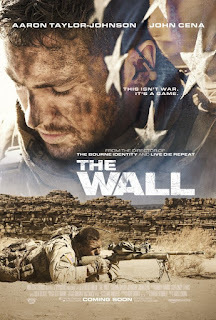 The Wall (♦♦♦♦): taut psychological thriller about two snipers on opposing sides of the Iraq War in 2007. Visceral game of cat and mouse, raw, edge of your seat action that unfolds at a slow pace...Great editing, noteworthy performance by Aaron Taylor-Johnson. 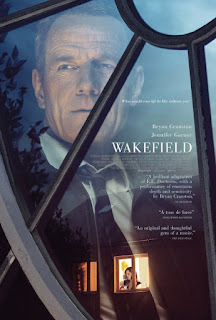 Wakefield (♦♦♦): Howard Wakefield is the picture of success. He is a lawyer at a law firm in New York, and he lives in the suburbs with his wife Diana and his twin daughters. After an argument with his wife before going to work, he comes home and falls asleep on the garage annex. No one ever goes there to do anything, so realizing that he has spent the night away, how can he explain where he was and be believed? Soon, Howard forfeits the life he knows for a more basic existence, sleeping undetected in the garage annex, and surviving on the food his wife and neighbors dump in the trash. The only witnesses of his furtive lifestyle are two kids with Down Syndrome that are his therapist-neighbor's boarders. Small cast led by Bryan Cranston and Jennifer Garner (her best performance yet since Dallas Buyers Club)... Intimate, brilliant portrayal by Bryan Cranston of a man in the midst of a mid-life crisis. Explores questions of identity, the dynamics and roles in marriage, the confines of the mind, and loneliness. Beautiful told, this is one of the extremely few artistic movies that have come out this year. I loved the adaptation of Big Little Lies and thought the performances throughout were just stunning. Two movies that sound worthy of watching. Thanks Carmen! They are, each with their own merits. The Wall actually looks really interesting. And judging by the trailer it would seem John Cena can actually act. Now, that is an unexpected revelation! He doesn't do much acting because something happens, but the little he could do, he did well. How many episodes or seasons was Big Little Lies? People swear by her books but I haven't tried one yet. A bit of a soap opera -- with more suspense? It's only seven episodes, one season, though I think they may want to milk it a little more. Despite what the blurb and my review may suggest, it is surprisingly dark. Not like a soap opera; not much love there. I highly recommend it! And some people like Sarah do not like her books. Ohh - I really fancy Bit Little Lies - thanks for reviewing.